I loved this book when I first read it and upon a re-read nearly 10 years after publication, it still stands out as a great story. Like one other BCer, I wanted to hop the next plane for Savannah. I didn't bother with the movie version because in many cases the movie pales by comparison. Currently being read by husband - will be available for release when he's finished. Husband finished and enjoyed the book as well. Wants to make trip to Savannah and is calling our cat "Lady Chablis" on occassion. Promised to Marina in Hollard - will be sending in next couple days. Finally...Ive gotten around to reg. this book that I received end of Oct...sorry for the delay!...I'll get reading asap! This book I reveceived from Marina, here in Deventer. I became quite curious, after reading all the reviews when it came out, but I never came round to actually reading it. Thanks for offering it to me, Marina! I will start soon! I finished it this morning. I found it an absolute gem. While reading I liked it even better, knowing that these are actual facts. This gave me an interesting perspective on my attitude towards novels - the more I like them, the more I want them to be true. I guess it might have to do with getting to know the people in the book you are reading, liking them, feeling familiar to them and wanting them to be part of the real world. I did see the film, some years ago, which gave me the face and voice of Kevin Spacey as Jim Williams. No hindrance there, I think he is a great actor. The story, in a nutshell: journalist from New York comes to the Georgia town Savannah, gets to meet and gets to know the people there and what happens to them. This is the book he wrote about them. I will keep it at that, no spoilers. 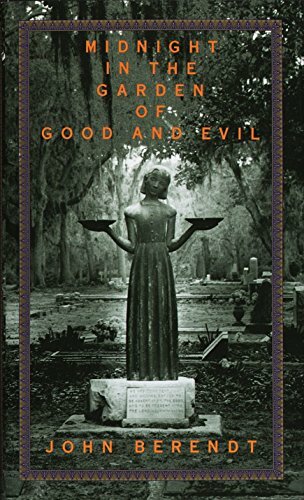 I remember from the reviews that this book was a great success, not in the least for the people in Savannah themselves, who are proud to recognise themselves in these pages. As I understand there are some who even played themselves in the motion picture. Which I would really like to see again, if only for that reason. To Janna2, who has been looking forward to it for some time now. This is one of these rare occasions where I wish not to part permanently from a bookcrossing book. Janna2, will you get it back to me after you have read it? And enjoy! I am sure you will! It was the description of Biba89 which made me curious about this book. Last sunday she gave it to me for reading. I hope I will enjoy it as much as she did. Very fascinating. Actually it is just the story of a small town in de south of the USA, but it feels like this same town is a person you learn to know better and better as the book goes on. I wanted to enjoy every page of it, therefore it took me a long time to read it. It's one of the best books I've read this year. I'm glad I got the opportunity through you, Biba89!! It's going home now! Vanmorgen naar het postkantoor gebracht. And here it is! A very fast travel, for once. And it came with a surpirse.. a ringbook I had no recollection of signing up for. Anyway, I am glad you'ven enjoyed the Midnight so much! Hai, I was at the day of the park in Deventer in a bookcrossing stand and I took the books that where left add the end of the day home whit me. Because most books where not numberd. This book was allready on the list off bookcrossing. So it is in my hands. I don`t no when I release it. Mayby i try tot read it. But my Englisch is not so good. Dit boek zet ik in de boekenkast in de huiskamer van het Hostel. De boekenkast/ huiskamer is op de eerste verdieping van ons prachtige 102 jaar oude oude jachthuis. I left this boek on the bookshell in the Hostel where I work in Gorssel. I Hope you like it. Please leave it somewhere else en tell us if you liked it. Today I've found this BC-book in the wild - in the Stayokay Youth Hostel in Gorssel, where I had a family reunion today. Splendid! I was delighted, even though I know nothing about the book and I'm not sure I'll read it. Still I was curious to see who'd put it there and I'm excited to find that this is such a well-travelled book. I'll make sure it'll travel some more eventually. And I'd like to take this opportunity to say HI to all you BC-ers out there! I've read approx. 1/3 of the book and I still don't want to visit Savannah and meanwhile the Lady Chablis annoys me so much that I'll leave it at this and I will go looking for a more appreciative reader! The only thing I've really appreciated of this book is the leisurely pace of the story.